Virgin Atlantic has unveiled details of its long-awaited Airbus A350-1000 aircraft, which includes an entirely new Upper Class cabin, featuring a brand new suite and social space. On sale this month, the airline’s first A350, named Red Velvet, will take to the skies in August, as it flies from London Heathrow to New York JFK, followed by other services to JFK later in the year. Virgin Atlantic has ordered a total of 12 Airbus A350-1000, all scheduled to join the fleet by 2021 in an order worth an estimated $4.4 billion. As the first airline to introduce an on-board bar, Virgin Atlantic has taken its customer proposition to the next level on the A350, as customers can now enjoy a social space known as The Loft. As the largest social space in the airline’s fleet, it’s designed for customers to gather, chat, enjoy a drink or dine with friends. The Loft extends the airline’s world renowned Clubhouse experience to the skies, offering a wide range of cocktails, and the option for customers to dine together. As well as enjoying luxury comfort and high end finishes, customers can settle in with Bluetooth headphones and connect to the 32” screen – catch a show, or watch the live tailcam. The Loft is not the only innovation to the Upper Class cabin, as customers can also experience an entirely new suite, which has been designed in collaboration with a number of Virgin Atlantic’s most frequent flyers. Every seat now faces towards the window and offers deployable privacy screens. The suite boasts Virgin Atlantic’s largest ever in-flight entertainment screen, at 18.5”and features intuitive new system, controllable by customers’ own personal device. In line with the rest of the fleet, every customer will still have direct aisle access. 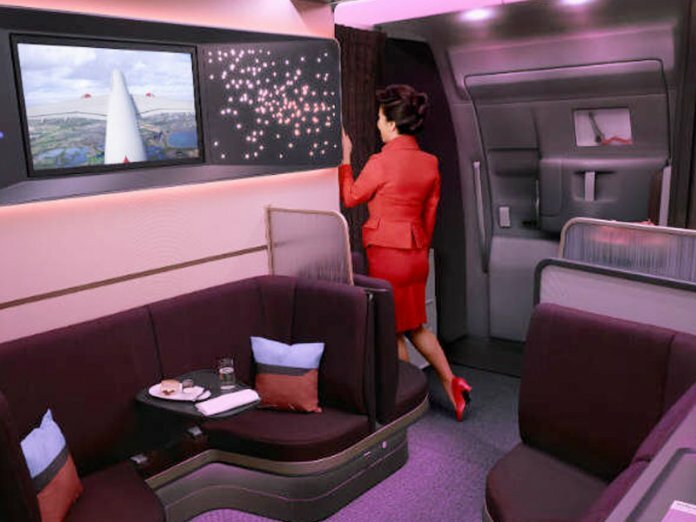 Customers travelling in Virgin Atlantic’s award winning Premium cabin and its much loved Economy cabin will also be able to enjoy the increased levels of luxury and comfort the A350 has to offer. Premium customers will also enjoy increased space for storage, a four-way adjustable headrest and a luxurious leather. The entire aircraft will also have access to high speed wifi as well as the unique and personalized service of Virgin Atlantic’s world famous cabin crew. The A350 is designed to be 30% more fuel and carbon efficient than the aircraft it replaces and is expected to reduce the airline’s noise footprint at its airports by more than half.